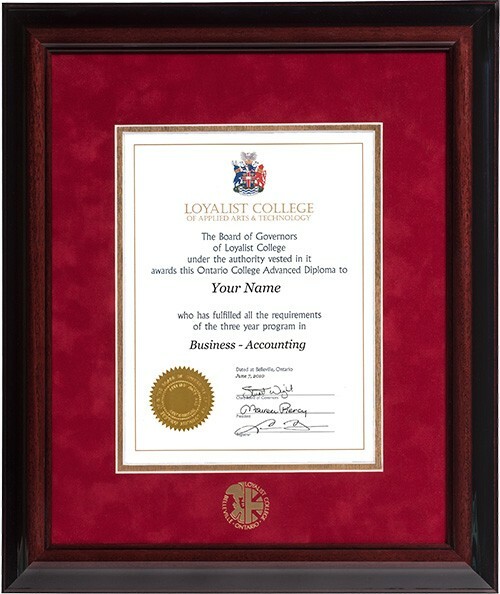 Order one of our diploma frames online to be shipped directly to you or to the College for pickup. Click here to order your frame online. All of our frames are made of solid wood. All wood used in our moulding profiles is harvested from controlled and regulated tree farms where reforestation policies are strictly enforced. For every tree that is cut down, two seedlings are planted. All mats used in our frames are made of 100 percent recycled materials. All surface papers are produced with environmentally friendly colourants and all components are laminated with natural, environmentally sound starch adhesives. The suede mat in our Executive frame is made with a white conservation quality core and backing which meets all standards set by the FINE ART TRADE GUILD for conservation matting. 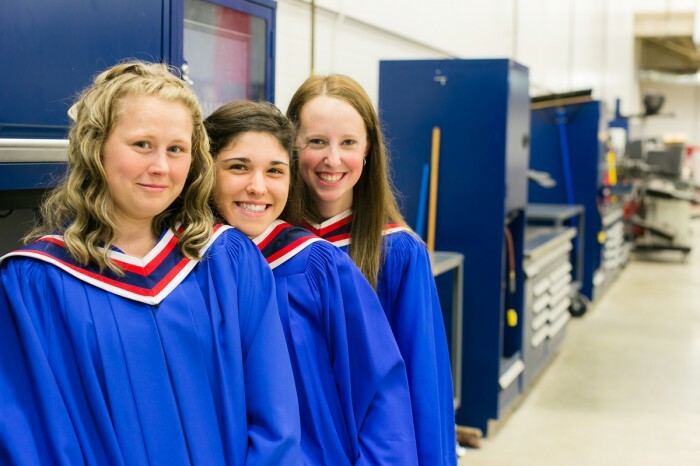 All frames are made in Canada and are sold with a quality guarantee against any defects. This is a luxurious Italian moulding that features a classic swan’s neck design. It is layered with two coats of water based lacquer, giving its wine colour a rich, glossy finish. It is assembled with a double Crescent brand white core acid free CONSERVATION mat, red suede over gold. 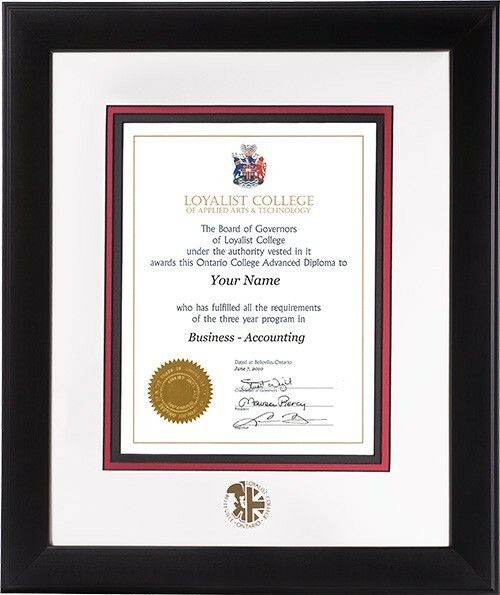 The Loyalist College logo is hot stamped in gold foil. Order the EXECUTIVE frame online. This Italian profile has an edge to its design. It fits seamlessly into any home or office décor for those prefer black accents. It has a deep black semi-gloss finish with an understated Italian flair. It is assembled with a triple Crescent brand black core acid free ECO mat, white over red over black. 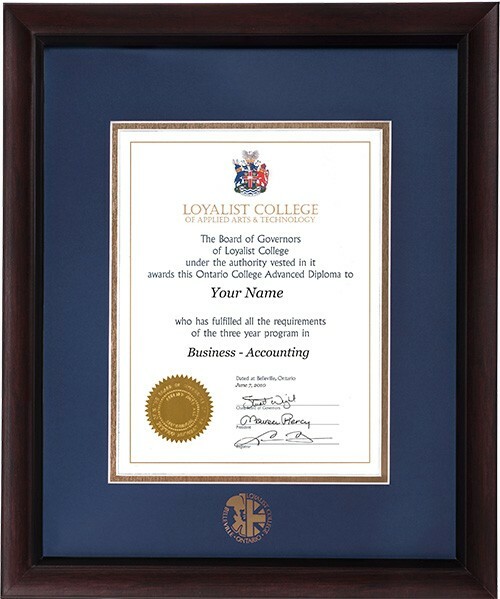 The Loyalist College logo is hot stamped in gold foil. Order the INFUSED BLACK frame online. This profile has a gentle sloped contour finished in a rich, deep burgundy shade with black accents and a black lip on the inside edge of the moulding. It is assembled with a double Crescent brand white core acid free ECO mat and js available in a choice of either red over gold or blue over gold. The Loyalist College logo is hot stamped in gold foil. 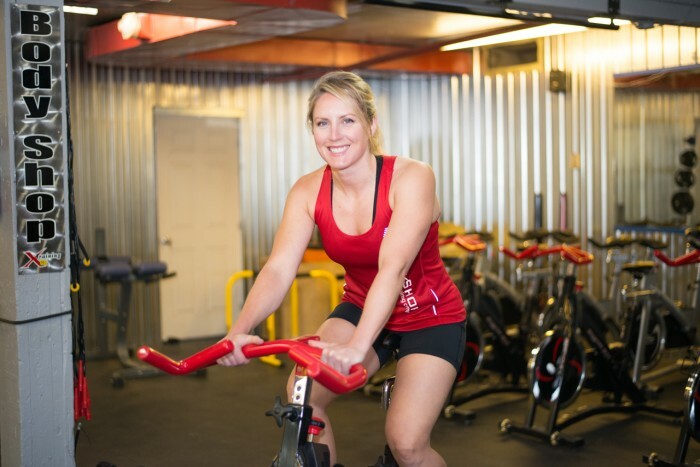 Order the BRENTWOOD (RED) frame online. Order the BRENTWOOD (BLUE) frame online. To order your frame from our new online store click here! 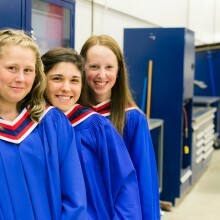 Frames can also be purchased at the Loyalist College Bookstore.